» NHL Grab Bag: Can Someone Please Help Randy Carlyle With His Whiteboard? NHL Grab Bag: Can Someone Please Help Randy Carlyle With His Whiteboard? Welcome to a weekly blog post of thoughts and observations from the past few days and/or decades of NHL hockey. Recognizing the three moments from around the league that produced the most comedic fodder for fans this week. I know they’re supposed to be a young team, but this seems to be taking it a little too far, no? The Ottawa Senators coach somehow managed to make it through the entire game without noticing his identical twin sitting right behind him. The doppelganger later claimed he was just a regular fan who happened to randomly have seats right behind the bench, which — it should be pointed out — is exactly what a clone sent back from the future to kill Paul MacLean would say. What Is the Hockey World Pretending to Be Outraged About Now? Nothing makes hockey folks happier than being outraged about something relatively unimportant. Each week, we’ll pick one topic fans are complaining about and try to figure out if it’s justified. 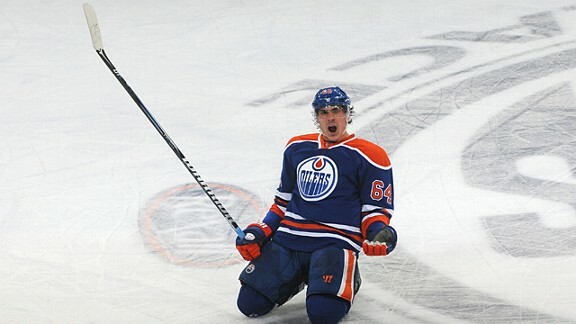 The issue: Edmonton rookie Nail Yakupov scored the tying goal with seconds left in Thursday night’s Kings–Oilers game, and then celebrated by doing his best Theo Fleury impression. The outrage: Everybody knows you never go full Fleury! That’s especially true since Fleury’s goal came in overtime of a must-win playoff game, and Yakupov’s was in the third game of the regular season. Act like you’ve been there before, kid! Plus Yakupov is Russian, which apparently factors in somehow. Oh, wait, I’m told that Theo Fleury himself has something to say? There you have it, folks. If it’s OK with Theo, it should be OK with us. Case closed. NHL history is filled with legendary players whose stories are passed down from generation to generation. This is not one of those players. This week, our obscure player is Dave McLlwain, a defensive forward who played in the NHL for 10 seasons (followed by 10 more in various European leagues). He almost definitely holds the NHL record for the most consecutive consonants at the start of a last name. 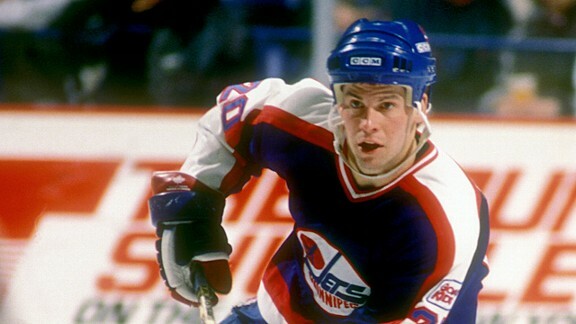 During the 1991-92 season, he was traded from the Jets to the Sabres to the Islanders to the Maple Leafs in three separate deals, making him the only player to play in four different divisions in the same season. That’s a pretty impressive pair of accomplishments right there. By the way, check out the cities McLlwain played in during his NHL career: Pittsburgh (twice), Winnipeg, Buffalo, Uniondale (twice), Toronto, and Ottawa. So let’s add a third fact: Apparently, Dave McLlwain really enjoyed being cold and bored. In which we employ the Socratic method in an attempt to settle the issues that have long plagued hockey fans. This week’s debate: Was it OK to score using that one backhand/forehand move that worked every time in NHL 94? In favor: Hey, if it’s in the game, it’s in the game, right? Opposed: You are a monster. Opposed: You were a terrible player, and everybody hated you. This includes your friends, family, and pets. In favor: Oh, come on. If you don’t like it, just don’t give up breakaways! Opposed: Great idea in theory, except that breakaways made up one-quarter of all time spent playing NHL 94. (The other three-quarters: one-timers, more one-timers, and complaining about how they took out the fighting.) So if you were playing somebody who thought using The Move was OK, there was nothing you could do to avoid giving up 20 goals a game, short of unplugging their Genesis and dropping it into their fish tank. Which you absolutely should’ve done, by the way. Opposed: Literally every person who ever used manual goalies in NHL 94 grew up to be a serial killer. The final verdict: If you were one of the people who used this move, you should’ve been rounded up and sent to a penal colony with the people who looked at the other guy’s controller when he was picking his play in Tecmo. In which I will complain about things that probably only matter to me. For the last few years, the league has been making its referees announce goal decisions to the crowd. This replaced the old system, in which the referee would relay the decision by either waving his arms or dramatically pointing to center ice while the crowd went nuts. It was part of the NHL’s ongoing initiative to take everything cool about hockey and ruin it. 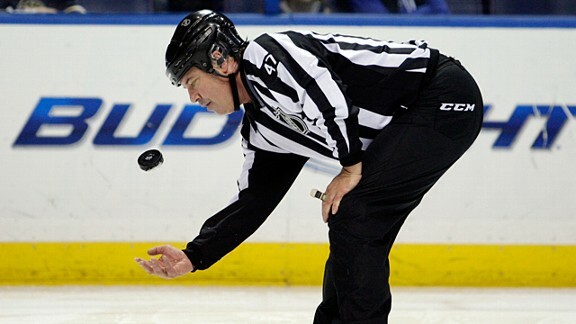 The first problem is that an NHL referee’s microphone has literally never worked. Not one single time. For some reason, the NFL can get them to work, but the NHL can’t. Apparently, the functional microphone store makes you show a decent television contract as ID. Potentially related to that first point, the ref always looks like he’d rather swallow his own tongue than make this stupid announcement. Remember in school, when you had to do public speaking, and that one kid would always get a few seconds into his speech about Koko the talking gorilla and then throw up all over himself? That kid grew up to be an NHL referee. What I’m trying to say is that anything that makes me feel sympathy for a referee is clearly unnatural and needs to end immediately. Remind me to work in a Kerry Fraser joke before the end of this post. In which we select one page on capgeek.com and stare at it while a single tear rolls down our cheeks. Who else could we lead off with other than Ilya Bryzgalov’s player page? Seriously, just look at this thing. It’s awe-inspiring. 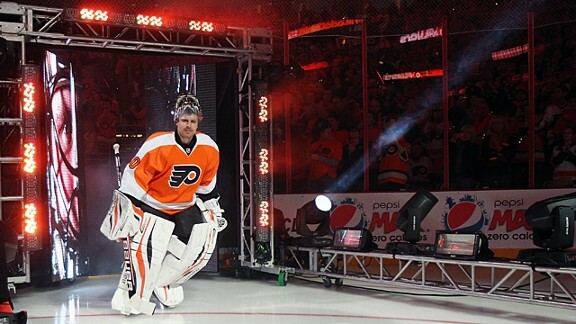 Let’s summarize: Bryzgalov has eight years left on a nine-year, $51 million deal he signed in June 2011. It’s front-loaded, but the salary dips this year because his agent apparently knew we’d lose half a season to the lockout. When this contract ends, Bryzgalov will be 40 years old and will probably be living in a child’s sandbox that he thinks is the surface of Neptune. Oh, and the Flyers traded away Jeff Carter and Mike Richards in part to make room for this deal. And did we mention that they’re already rumored to be in on Roberto Luongo? Never change, Philadelphia goaltending. Never change. Whether it’s Coach’s Corner, his regular media appearances, or a Twitter account that’s presumably meant to be performance art, Don Cherry is everywhere. What’s he been up to this week? Don Cherry was standing up. Look, I know this doesn’t sound like a big deal to some of you, but you have to understand: Don Cherry does not stand up. His entire job description basically consists of five things: wearing a funny suit, telling kids not to put their sticks in front of slap shots, mashing his desk, mispronouncing names, and then getting angry about how much time is left. And he does all this while sitting down because he just does, OK? Until Saturday. For a generation that grew up watching Cherry every week, it was disorienting. And it led to a lot of questions. What happened to his chair? Did the CBC sell it between games because of funding cuts? Did somebody come over and borrow it for an important meeting in the boardroom? Does he end every Coach’s Corner by breaking it over Ron MacLean’s head WWE-style as soon as the camera goes off? So many questions. Expect this Saturday’s late-game Coach’s Corner to put up record ratings, as a confused and frightened nation tunes in to see whether Don Cherry got his chair back. In addition to being a great source of adorable pets and functionally illiterate commenters, YouTube is a gold mine for old hockey clips. Each week, we find one and break it down in excruciating detail. OK, let’s all link arms and try to make our way through this. Apparently, this video was recorded for charity. I don’t know which charity, but I’m going to go ahead and assume it was an organization dedicated to helping hockey players who grew up without access to charisma. I hope a Flames fan can tell me who the guy is at the 0:30 mark, because he is more intense about pretending to play that trombone than I’ve ever been about anything in my life. “You can climb the highest mountain, you can put a man on the moon, you can see to the horizon, you can sing a brand-new tune …” Wait, those last two things aren’t actually difficult. I don’t think that singing a new tune really belongs in the same stanza as the moon landing. And the horizon stretches across your entire field of vision — are there really people who have trouble seeing it? Other than Kerry Fraser, I mean. What a weird coincidence that every single member of the 1986-87 Flames had the exact same singing voice. Yes, that’s a young Brett Hull at the one-minute mark. When this video was filmed, he had one career goal. After this video, he scored 740. I’m not saying that “Red Hot” was the turning point in his Hall of Fame career, but I think we can all agree that it obviously was. If you’re an NHL team and the Flames are in town, how do you not play this video on the scoreboard during every stoppage in play? How long do you think it took them to nail the choreography for the big three-man electric-guitar sequence at the 2:15 mark? And do you think any of them felt any cognitive dissonance over the lack of actual guitars in the song? Nice digital watch, Al MacInnis. In case you’re wondering, that’s former 50-goal man Mike Bullard playing the role of the lead singer who’s just a little too into all of this. I’m pretty sure that if this video were just 30 seconds longer, he would’ve started doing the Axl Rose backward-spin-with-the-mic-stand move. “You can puuuutttt … a thing behind you!” No, no, not this video you can’t. Hey, can we just point out that you actually can touch a flame when it’s red hot? Bottom line: This music video was basically what “Thriller” would’ve been if they’d replaced all the zombies with bad mustaches.